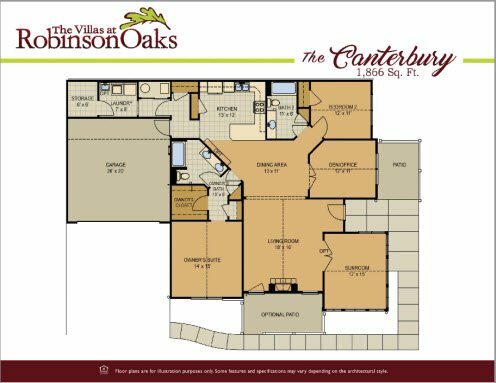 The Canterbury brings your dream of a comfortable, exciting, and versatile home to life. From relaxing on the weekends to entertaining your closest friends and family, your lifestyle will never feel as natural, well-equipped, and stress-free as it will from living in a Canterbury. When you live in a Canterbury, the possibilities are endless: transform your third room into a home theater, decorate your sunroom for friendly mixers, enjoy the comforts of a private den. We carefully designed the Canterbury to satisfy the highest of home standards and lifestyle desires. That is why the Canterbury is the beloved home of many who accept nothing short of excellence and cherish immaculate attention to detail. *Although all floor plans, illustrations, and specifications are believed correct at the time of publication, the right is reserved to make changes, without notice or obligation. Windows, doors, ceilings, layout and room sizes may vary depending on the options and elevations selected. This information is for illustrative purposes only and not part of a legal contract. MOVE IN READY, fully upgraded Canterbury! We will contact you shortly about The Villas at Robinson Oaks. Thank you for your interest in Epcon Communities. We have a brand new model home! Come see what's new and purchase your villa soon, as there are a limited number of homesites still available! ONLY 15 Homesites Remain. We have 3 MOVE IN READY HOMES and are offering a Low Deposit!!! Call for information 704-853-9904.